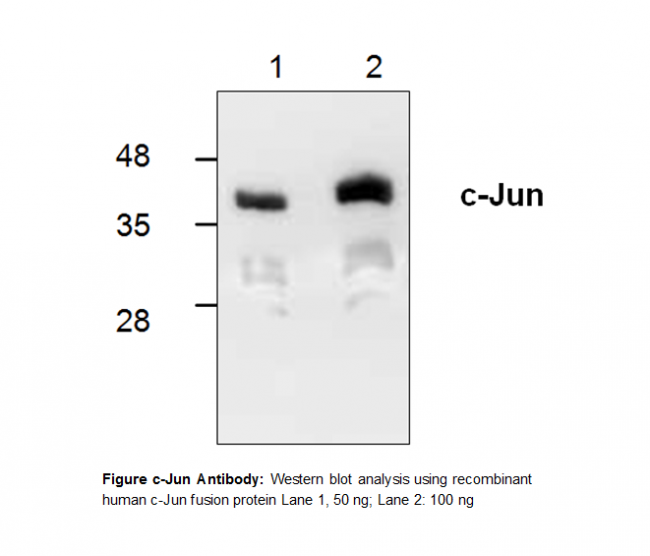 c-Jun antibody | 3009 | BioVision, Inc. In phosphate buffered saline (PBS), pH 7.2, containing 30% glycerol, 0.5% BSA, 5 mM EDTA and 0.03% proclin. 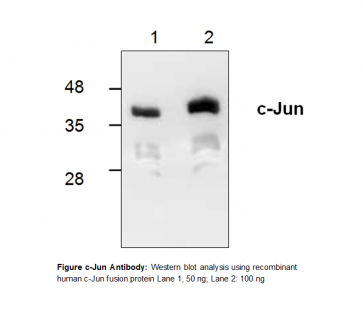 The antibody can be used in Western Blot analysis (0.5-4 µg/ml). However, the optimal conditions should be determined individually. 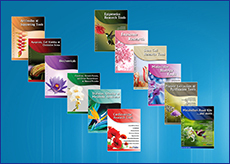 Recombinant human c-Jun (Cat.# 7001-100) can be used as a positive control. c-Jun is a component of the transcription factor AP-1 that binds and activates transcription at TRE/AP-1 elements. The transcriptional activity of c-Jun is regulated by phosphorylation at Ser63 and Ser73. Extracellular signals including growth factors, transforming oncoproteins, and UV irradiation stimulate phosphorylation of c-Jun at Ser63/73 and activate c-Jun dependent transcription. The MAP kinase homologue, JNK, binds to the N-terminal region of c-Jun and phosphorylates c-Jun at Ser63/73. The activity of JNK is stimulated by the same signals that activate c-Jun.